This is Kitty’s practice blog. So far, so good. This is a photo of my favorite moment during my favorite adventure. 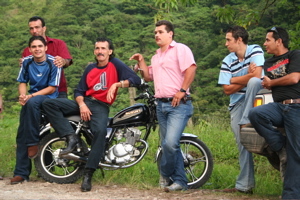 These super cool dudes are watching the procession to church during the celebration of San Luis in the town of San Luis. Something tells me they won’t be going to church.